Idol worship at SikhNet Yogi Bhajan tantric dera is a wake-up call for Sikhs who complete SikhNet "Donation Survey"
Sikhs will want to see these pics of idol worship at Yogi Bhajan's tantric yoga dera before completing the Sikh Net "Donation Survey". Link to the SikhNet "Donation Survey"
SikhNet asks: "Please be so kind as to describe any changes or improvements that you would like to see SikhNet make." My answer: SikhNet should allow constructive & legitimate criticism of SikhNet & Yogi Bhajan on all SikhNet forums and news articles. 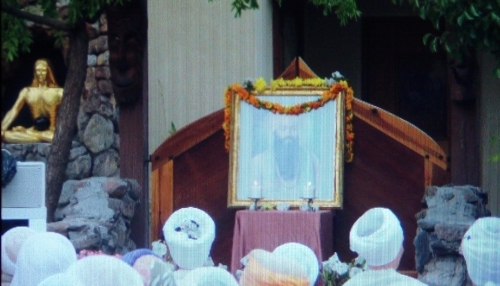 SikhNet should take a proactive role with 3HO in removing all images & statues of Yogi bhajan & Baba siri chand from their Gurdwaras and stop promoting Yogi Bhajan's anti-Sikh tantric yoga agenda. The first image shows Yogi Bhajan's wife, Inderjit Kaur Puri, two sons, Ranbir Singh Bhai and Kulbir Singh Puri, and daughter, Kamaljit Kaur Kohli, and some of his followers sitting in front of Yogi Bhajan's garlanded photograph with the swami leading the puja. "Yes, this is definitely the ash immersion," said Sadhvi Bhagawati Saraswati, a spokeswoman for the ashram. "The puja, ceremony of rites, happens first and then the ashes are actually immersed."